Chikmagalur is a valley with breath taking natural beauty. Increasing the beauty of the valley are the various holiday resorts that share a part of this natural beauty. 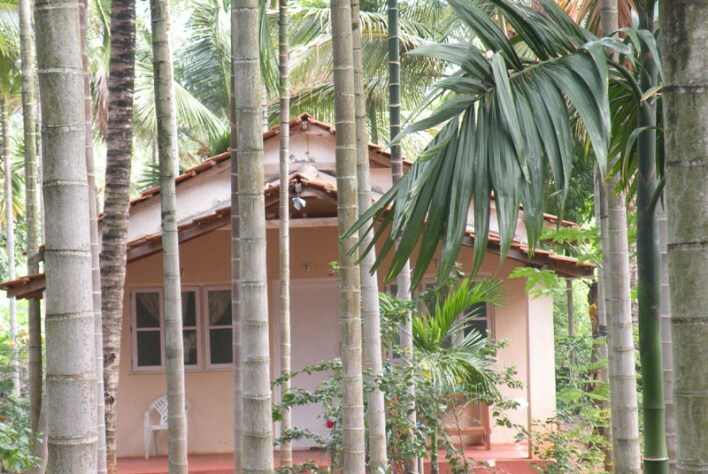 One such peaceful and greenery soaked resort near Chikmagalur is the Kanthi Nivas. Kanthi Nivas is an ideal holiday retreat with a backdrop of untouched nature. Here the sun blesses the resort in full glory while the green leaves on the trees make the breeze feel wonderfully cool. The resort is undoubtedly a place for rejuvenation of weary souls. The pure air of the resort blends with the scenic beauty of the place to present a feel of mesmerizing beauty. Nestled away from the hustle and bustle of city life this quite place extends undeniable appeal for the visitors. Apart from the sights and sounds of the natural beauty abundant in the resort, Kanthi Nivas also offers its visitors a comfortable stay with all necessary amenities to enjoy a perfect holiday. A number of exotic locations and sightseeing destinations are in close vicinity of the resort. This ensures that visitors will never have a dull moment during their stay at the resort. With several modern facilities for a relaxed stay indoors and various options to explore the natural beauty outdoors this resort near Chikmagalur is undoubtedly one of the finest choices for a revitalizing holiday. Kanthi Nivas extends a relaxed stay with all necessary comfort. The resort has 5 beautiful Swiss mountain style chalets and a spacious dormitory for accommodation. The well-maintained and spacious rooms make for a nice stay. Camp fire facilities near each cottage add to the romantic feel of the place. A large communal camp fire ensures that visitors have a common place to enjoy the evenings with other visitors if they want to. Excellent food is served at the resort. The food is prepared keeping in mind the needs of visitors of all ages. Hygienic and healthy food in varieties of vegetarian and non-vegetarian type is served. Early morning tea and coffee awakens visitors to the start of a great day. An early breakfast ensures that visitors get ample time to explore the resort and beyond during the day. Elaborate lunch and dinner make sure that visitors eat well during their stay at the resort. Apart from the main meals, evening snacks and tea or coffee are also offered to the visitors. Facilities for arrangement of baby food exist, but visitors have to notify beforehand for such facilities to be arranged on time. Located under Tarikere Taluq of Chikmagalur district, Kanthi Nivas is easily accessible. Private vehicles and cabs can be hired to reach the holiday retreat. Mangalore International Airport is the nearest airport to the resort. From there visitors can take a vehicle on hire to reach the Kallathipura Post in Tarikere Taluq to reach Kanthi Nivas. Apart from these tours and treks, visitors can engage in various recreational activities such as enjoying a game of chess, cards, carom boards, going on bicycle rides, playing shuttle badminton, enjoying dinner at the enclosed camp-fire area on request, etc. Kanthi Nivas offers various rates depending on the type of package chosen for stay. There are discounted rates for senior citizens of above 60 years. The rates are inclusive for 3 meals and 2 snacks. For visitors opting for the Platinum package, unlimited vegetarian and non-vegetarian food and beverages are offered. To get updated information regarding reservations, cancellations, details about various packages, other offers and prices visit tariff page.